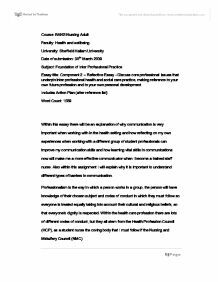 Essay title: Component 2 – Reflective Essay - Discuss core professional issues that underpin inter professional health and social care practice, making reference to your own future profession and to your own personal development. 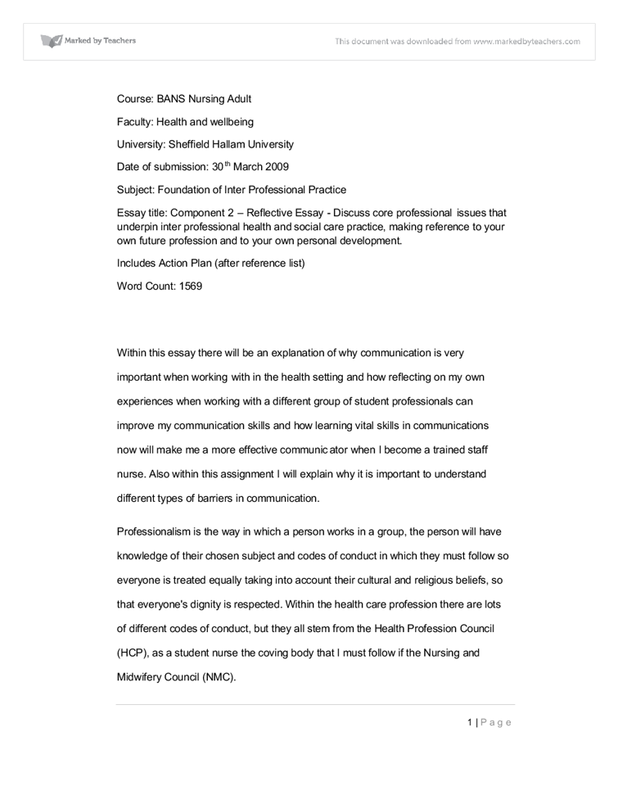 Within this essay there will be an explanation of why communication is very important when working with in the health setting and how reflecting on my own experiences when working with a different group of student professionals can improve my communication skills and how learning vital skills in communications now will make me a more effective communicator when I become a trained staff nurse. Also within this assignment I will explain why it is important to understand different types of barriers in communication. Professionalism is the way in which a person works in a group, the person will have knowledge of their chosen subject and codes of conduct in which they must follow so everyone is treated equally taking into account their cultural and religious beliefs, so that everyone's dignity is respected. Within the health care profession there are lots of different codes of conduct, but they all stem from the Health Profession Council (HCP), as a student nurse the coving body that I must follow if the Nursing and Midwifery Council (NMC). Communication is vital within the health care profession but in order to be a good communicator you firstly must be able to understand the different components of communications they are verbal, non verbal communication, and written. Verbal communication is when we speak using words, there are many barriers that can arise within the health care setting sometimes one of these being semantic barriers, this is the words that are used within a conversation for example when an uneducated person visits the doctors, and the doctor uses scientific words and therefore the person would not fully understand what they have been told. This shows how when communicating within the health care setting jargon should not be used. Some other barriers with verbal communication can be the dialect, language and tempo. Non verbal communication is everything other than spoken words, this includes paralanguage which is ‘um’ or ‘ah’, the volume of the talking, the pace and accent. Non verbal communication is also the appearance/dress of a person as this can affect how a person communicates within a health care setting, a patient will talk to a nurse about their health in a different way to the cleaner because of the way we dress, and it shows what role we are doing. A very big part of non verbal communication is facial expressions as these are indictors to others about our feelings, attitudes, states of mind and relationships. Written communication is very important between different health care professions as they pass on messages about the patients within their care, for their problems this can be better than verbal communications as if it is written down then the message will not change as when a message is verbally passed between people it can become distorted, but there are barriers in written communications as if the persons hand writing is unclear or the wrong thing is written down, or the person reading it doesn’t understand the language. Even though all three of these ways of communication have problems they all can be an effective way to communicate with others when used in the right way. In order to understand how communication is effective with a group we need to know how a group is defined, in the oxford dictionary a group is explained as a “lump” or “mass” and this is a good way to describe a group, but a group could be explained as more than one object, to describe a group of people the best way to define it is; two or more individuals according to Burton and Dimbleby (1995). In order for a group to work, these people must have shared common characteristics, these being interest values or having a goal in order to be a successful group. Within a health care setting different professions work together, so a group of people is called a Multi disciplinary team, their shared common goal in most cases is that they have to treat a patient together to get the best outcome for their health. Working in a group can be challenging from time to time, as a group of people in order to work well together need to have a common goal (Burton and Dimbleby 1995). Most people are in one or more groups of some kind, but some of these groups are not chosen but are assigned to us from birth, just like our family. As we do not choose to be in this group, this can sometimes mean that people in this group don’t have common goals, therefore leading to a dysfunctional family. Hartley (1997) said that a person only has three groups these being family, friendship and work groups. It is described that the work group is an achieved and more formal to other groups, where as our family and friends are more laid back. I personal found this out when given a group task to complete, we were put into a groups of eight people, all from different student health professional courses, we were given the task to work together and answer a series of questions and we were left to our own devices with little guidance from the tutor to organised how we were going to do this. As we no longer had any classes together before the work was due in we decided together to answer the questions individually and post them on the group discussion board within the next five days then on the Tuesday evening we would meet and discuss what we had all put so that we could then decide how to piece the work together. We had problems with this as some of the people in the group had got the days mixed up and were on the internet a day before we had planned. This caused problems as some people in the group had not yet posted their answer to the question. I was one of the people as I didn’t have the internet for a couple of days so was unable to post my thoughts before the deadline that we had set for the group. The next problem came as when the time due to meet online and discuses the answers between us some of the people didn’t conuibute to how we should put the answers together. We also had a problem of the fact that no one would take lead of the group to sort who would write the questions out. We decided to meet up, but there was no time when we could so one person of the group took control and combined the questions together. Then posted the finished piece of work on the discussion board and gave everyone an opportunity to change and add to the questions. I believe this worked well in the end even though there were some teething problems. According to Judy Gahagan (1975), we form a group as we believe that “one or more heads are better than one” as most of the time we will form a group to complete a task that one individual couldn’t complete and it would be solved quicker. Donald Pennington (1986) researched in to groups and he found that a group can solve problems faster than one person. This is proven in large company’s where staff members get together in a group to brainstorm new ideas and to delegate people different jobs so that the task gets done quicker. From this group work, it was hard as we needed someone to delegate the work load equally between us, if that had been done we would have worked together more efficiently. Whenever I get given a task like this again I will make sure we do this and split the questions between the group so that everyone has a piece of work each so that everyone does an equal amount of work each and there is no confusion about who is doing what. Also from this experience my mind has changed as I personally think that social network sites are a good way of communicating but from this exercise, when it comes to professional work it is much easier to do this face to face. From this exercise I have noticed that the Honey and Mumfords (1986) Learning Style Questionnaire that I had taken, it showed me as a pragmatist, I can relate more to what this mean now as I do want to try out different ideas and if they are not done well I will try another way, also I didn’t like not having a clear way of working as it can get me very frustrated when the task is not getting done. Even though I do like to get a job done fast it depends on if the job is practical or academic from the VARK questionnaire that I also took this is shown as my result was multimodal with my visual, aural and kinaesthetic all scoring high scores of ten but my reading and writing scoring two. I think this is the reason why I didn’t take the lead in writing the questions out as I do try and avoid writing as much as I can, in order to improve my professionalism I will take up the challenge in writing a group piece of work as if there are any problems with the way I write then people in the group can check it before the work has to be submitted. Burton, G. and Dimbleby, R. (1998), More than words, An introduction to communication, Third edition, London, Routledge. What specific actions/resources are needed? Make sure that I participation in group discussions on blackboard To complete Submit group formative assessment work. Read through article given to me in class and take part in answering the questions on the discussion board on blackboard. Feedback from Tutor at end of the work. Test myself by having weekly spelling tests. Improve structure of word processed-work. Look at examples of good layout and structures of word processed work. Arrange lessons with dyslexia tutor to help me structure and use work better. Research communication in groups and learn the theory and talk more in classes and on placement to different range of groups of people. Aspect of Care Essay: The Post-Operative Care Following a Hysterectomy and Bilateral Salpingo-oophorectomy. The sample used in this experiment consisted initially of 246 children fitting the recruitment criterion, falling to 228 after attrition for various reasons. The sample appears to be convenience sample: the participants were obtained from a population that the researcher had easy access to (Parahoo, 2006). The vein enlarges and thickens eventually. Two needles are inserted to access it. One to remove blood and the other to return the blood after it has been pumped around the dialyser. A Synthetic Graft is similar to the AVF but where the vein is attached to the artery an artificial tube is used instead. If the carer were made aware of the problems beforehand they would have been able to use preventative measures to ensure a patient did not develop the ulcer. A support network of the multidisciplinary team must be in place to help situations of patients being nursed in their own homes. Chloe's wound dressing and maternity pad was regularly checked for bleeding. A small amount of ooze on her dressing was noted on her return to the ward, however this bleeding stopped within 30 minutes, was small in volume and did not compromise her haemodynamic stability. Actual/potential problems: Risk of chest infections due to reduced mobility. Risk of ineffective respiration reduced positional mobility in bed or when seated. Eating and drinking: Mr X enjoyed a normal diet and had a good appetite. He had no food allergies or particular dislikes. (Driscoll, 2000, p.182) The team followed Kubler-Ross stages: (K�bler-Ross, 1970, p235) we went through anger, where we questioned the need for a leader. Duck (1981) argues that an allocated leader is required as without a leader, competition for control inevitably takes place.